Who Is a 'Casual Taxable Person' under GST? The concept of Casual Taxable Person for one-time event/transactions is a new provision under the GST Law. How does this affect you? Read here. Casual taxable person means a person who supplies taxable goods or services occasionally in a taxable Territory where he does not have a fixed place of business. The person can act as a Principal or agent or in any other capacity supply goods or services for the furtherance of business. Mr.Ravi having the place of business in Bangalore providing Management consultancy services in Hyderabad where he has no place of business. Hence Mr.Ravi has to register as a Casual Taxable Person in Hyderabad before providing such services. a. Person includes individuals, Hindu Undivided Family, company including government company, firm, limited liability partnership, an association of persons, a body of individuals, co-operative society, local authority, government including a corporation. The liability to register under GST arises when the person is a supplier and the aggregate turnover in the financial year is above the threshold limit of 20 lac rupees. However, there are certain categories of suppliers who are required to get compulsory registration irrespective of their turnover. The threshold limit of 20 lac rupees is not applicable to them. One such supplier would be a Casual Taxable Person (hereafter referred as CTP). A Casual Taxable person cannot opt for Composition Scheme. A CTP has to obtain a Temporary Registration which is valid for a maximum period of 90 days in the State from where he seeks to supply as a Casual taxable person. 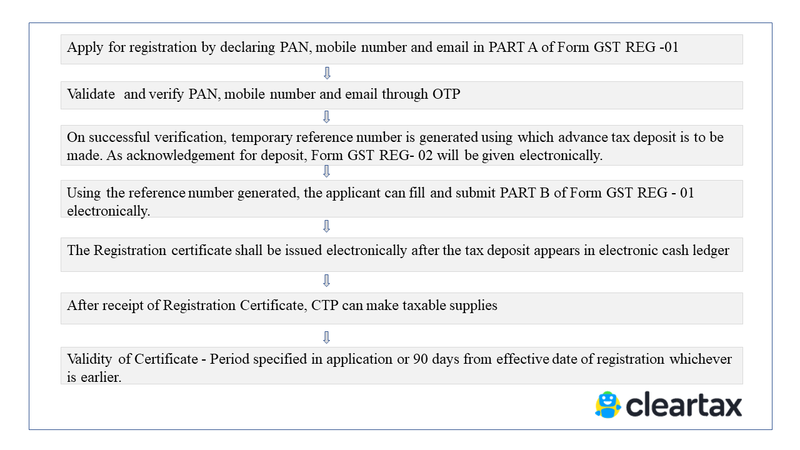 A CTP is required to make the advance deposit of GST (based on an estimation of tax liability). Say Mr.Ravi estimates his taxable services at Rs. 100000. He is required to make an advance deposit of Rs.18000 (18% of Rs.100000) to obtain temporary registration. Apply in FORM GST REG-11 before the end of validity of registration. An extension can be made for a further period not extending 90 days. The extension will be allowed only on deposit of additional tax liability for the extended period. A casual tax person is not required to file an annual return as required by a normally registered taxpayer. All Forms can be submitted at the common portal, either directly or through a Facilitation Centre notified by the Commissioner. CTP is eligible for the refund of any amount deposited in excess of tax liability which will be refunded after all the necessary returns have been furnished for the Registration period. Application for Refund of balance in excess of tax liability in the electronic cash ledger has to be made in serial no. 14 of the last FORM GSTR-3 return.